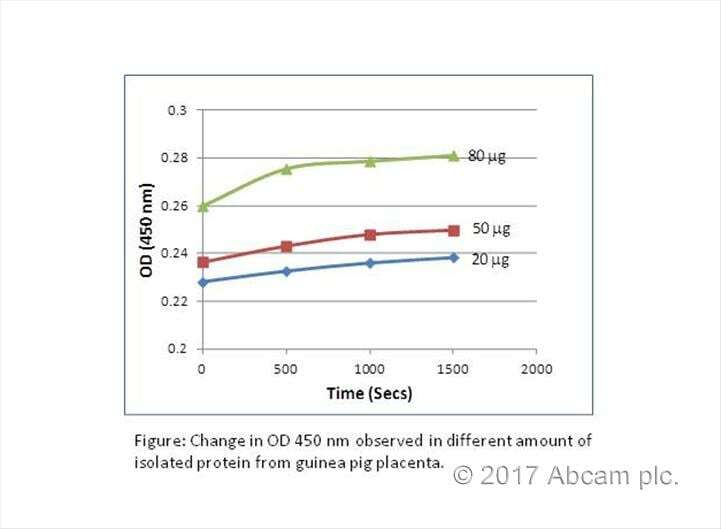 Complex I Enzyme Activity Assay Kit (ab109721) is a kit designed for the analysis of mitochondrial OXPHOS Complex I enzyme activity from human, rat, mouse and bovine cell and tissue extracts. Capture antibodies specific for Complex I are pre-coated in the microplate wells. Samples are added to the microplate wells which have been precoated with a specific capture antibody. After the target has been immobilized in the well, Complex I activity is determined by following the oxidation of NADH to NAD+ and the simultaneous reduction of a dye which leads to increased absorbance at OD=450 nm. By analyzing the enzyme's activity in an isolated context, outside of the cell and free from any other variables, an accurate measurement of the enzyme's functional state can be understood. 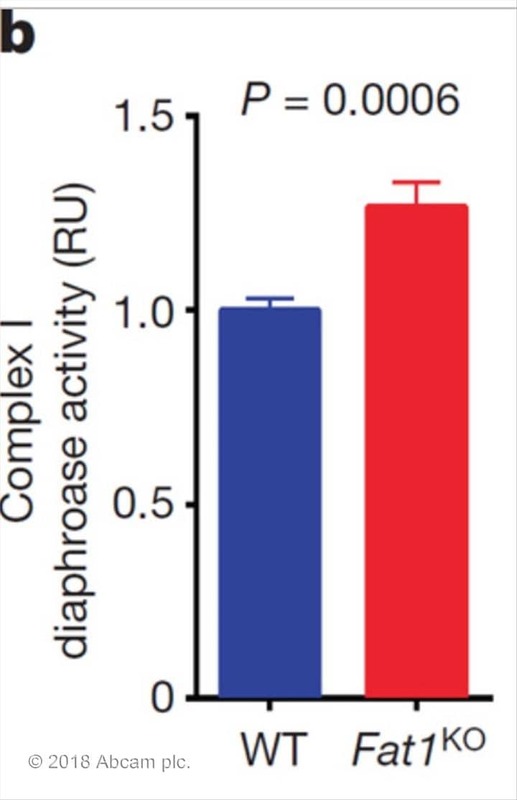 Complex I activity is controlled by enzyme amount and by post-translational phosphorylation at key specific regulatory residues. Cellular metabolism governs these two factors. Ultimately, the cell type and growth conditions will affect Complex I activity measurements. Note: This activity assay measures the diaphorase-type activity of Complex I. This activity is not dependant on the presence of ubiquinone and therefore inhibitors, such as rotenone, which bind at or near the ubiquinone binding site do not inhibit this assay. However, both the activity assay and the quantity assay described here are affected by enzyme assembly deficiencies. Review the mitochondrial assay guide, or the full metabolism assay guide to learn about more assays for metabolites, metabolic enzymes, mitochondrial function, and oxidative stress, and also how to assay metabolic function in live cells using your plate reader. ab109721 measures Complex I activity in human cultured cells within the recommended ranges given in the protocol. Example of Complex I activity measured in Hep2 cells is showed. (Note that these ranges depend on mitochondria preparation quality). ab109721 measures Complex I activity in human and rat cultured cells but also in tissues/tissue mitochondria samples within the recommended ranges given in the protocol. Examples of Complex I activity measured in different rat tissue mitochondrial samples are shown. (Note that these ranges depend on mitochondria preparation quality). Examples of Complex I activity measured in different rat tissue mitochondrial samples are shown. (Note that these ranges depend on mitochondria preparation quality). (A) ab109721 was used to measure Complex I activity in normal and Rho0 human fibroblast whole cell lysates at 1mg/mL. Rho0 cells are cells in which the mitochondrial DNA has been removed and therefore essential Complex I proteins are not expressed. As shown, the rho0 cells showed no/little complex I activity. (B) In a similar analysis, rat cardiomyocytes were grown for 5 days in ± 40 µM chloramphenicol (CAM) to inhibit mitochondrial protein synthesis, Complex I assembly and hence activity was greatly reduced in samples loaded at 0.5 mg/mL whole cell lysates. How the sample should be prepared? The sample extraction is native so care needs to be taken to extract the samples at equivalent starting concentrations to maintain the protein : detergent ratio and maintain enzyme integrity and activity. Step 3 – in this we recommend adjusting the lysed cell sample protein concentration to approximately 5.5 mg/mL as determined by some form of protein assay (you can take a small % of sample for this – it may need some prior lysis with SDS or other detergent based on the nature of the sample or protein assay conducted). Step 4 -Once adjusted it is time for the protein extraction using our supplied extraction detergent. 1) Yes, the mitochondrial isoaltion kit is suitable for use with all kits listed. 2) Suspend the prepared mitochondria to 5.5 mg/mL as described in the attached document and follow from step 5 (adding detergent to mitochondia) to generate an extract suitable for all kits. HCT116 cells were cultivated in standard DMEM medium for 48 hrs. Cell preparation was performed as described in the protocol. 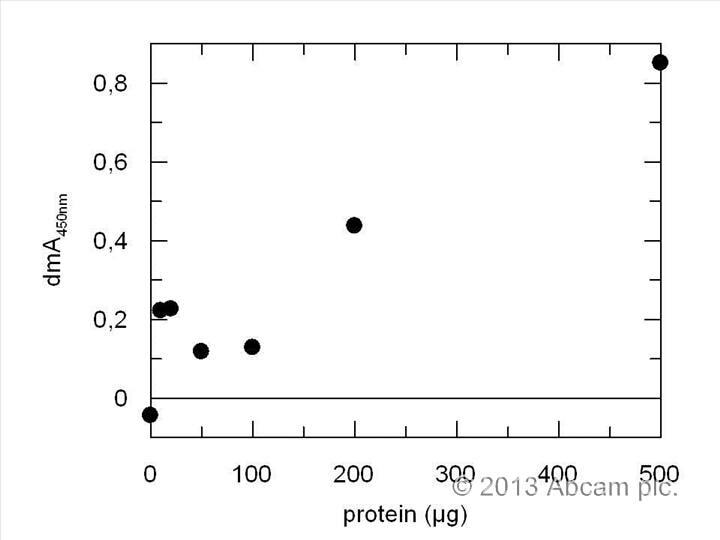 Protein concentration in each sample was quantified and adjusted by Bradford assay. We looked at complex I activity dependent on the protein amount applied to the plate (fig.) thus we would suggest to use protein amounts around 200 µg for this assay. The kit is easy to use but takes a long time to perform. The results seem to be reliable. Is the RIPA buffer compatible with this kit? What is the recommended lysis buffer? I would not recommend RIPA buffer because it contains SDS a powerful ionic detergent. The MS141 ab109721 Complex I activity assay contains a mild non-ionic detergent lauryl (n-dodecyl) maltoside which preserves Complex I activity. Do you have any recommendations for OXPHOS assays made specifically for blood? My guess is that the levels of OXPHOS proteins in whole blood are below the level of detection for activity assays. The activity assays for the most part require higher loading than the sandwich ELISA assays. We have tested Complex IV Quantity with whole blood with good results. The caveat is that whole blood must be fresh or must be frozen viable (protocols can be found in the literature). Whole blood should not be loaded in terms of mg of protein as most of the protein present in whole blood is albumin, so using the loading guidelines for tissues to load whole blood will result in loading well below the detection level (OXPHOS proteins are present in leukocytes and platelets only). My suggestion for the customer (if they want to use the quantity dipstick kits) would be to mix 300uL of blood with 900uL of extraction buffer, follow the protocol in regards to the rest of the sample preparation (ice incubation, centrifugation, keeping the supernatant and discarding the pellet). I would advise to the customer to add protease inhibitors to the extraction buffer to prevent degradation of proteins after extraction as granulocytes from blood have high levels of proteases, which will be released once the detergent is added. For loading on the dipsticks, the blocking buffer should be mixed with 50uL – 100uL of extracted blood so that the final concentration of blocking is 1X. This mixture can then be used to resuspend the gold conjugated antibody dried at the bottom of the well. Once the gold is resuspended the dipstick can be added to the well and allowed to wick the protein fully. Results will not be perfectly accurate (as loading cannot be done in terms of mg of protein), but will be more qualitative in terms of percent of signal from control mean or relative units. This approach will therefore require you to set up a control sample, which should be a pooled sample from several normal donors (10 – 20 donors would be ideal). From our experience, whole blood will not be as accurate as measuring isolated PBMCs only. But it will allow you to have a rough estimate of the trend. The advantage of isolating PBMCs is that they could run both activity and quantity dipsticks/microplates by following the same guidelines of cultured cells. I read the protocols of both kits (109721 and 109720). For preparing tissue samples, in dipstick kit, there are procedures about how to prepare, while in microplate kit, there is no relative procedure indicating how much tissue to start with and which buffer to use to homogenize the tissue. Can you explain more of those questions? Very easy to follow instructions and to standardize using cell lysates. Good specificity with microplane reader. I used isolated protein from guinea pig placenta to perform the experiment with this kit. Complex I enzyme activity can be detected. I'd like to use the tissue, once processed using ab110169, for the following kits 1) ab109721, 2) ab110413 and ab109902. So the main question is, can I store the brains by freezing (eg. liquid nitrogen to -80 deg C) and thaw the brains and produce extracts that will produce viable sample for use with all 3 kits noted above. Yes, you can extract mitos from frozen tissues but be aware that freezen/ thaw cycle would weaken the cell membrane and cause less recovery of intact mitochondria. A: There will be slightly loss if you extract enzyme from frozen mitos versus fresh mitos due to the degradation. Adding protease inhibitor to your mito prep would minimize the loss. As long as the tissues are properly frozen, the variant between different time points should be minimum (within weeks). However, multiple freezen/thaw cycle will cause difference. If you plan to extract sample from different days, make sure you make aliquots of your samples. if you plan to compare the enzyme activity from different samples, we highly recommend to prep the samples under the same condition. Can the mitochondria isolated with ab110168 be frozen prior to the use with mitochondrial activity kits in general and with ab109721 in particular. I can confirm the the mitochondria prepared with ab110168 can be frozen and stored in -80 C to be compatible for subsequent analysis using ab109721 kit.